Double-sided printing features "Corgi On Fleek" with Gatsby's signature poses! Keep them corgis on fleek in this soft premium T-shirt featuring a life size image of Gatsby, the world-famous corgi. Gatsby's signature pose, complete with tongue out, is sure to brighten your day! Your new favorite sweatshirt! This ultra premium navy sponge fleece sweatshirt is so soft and comfy, you'll never want to take it off! Eye-catching & stylish jumbo embroidered patch on a white background is so in style right now! Combined with an on-trend navy drop-shoulder seam, these sweatshirts will keep them corgis on fleek! Buy two pins and save $5! Show off your inner corgi with this jumbo sized first run, limited edition, Gatsby the Corgi hard enamel/nickel plated trading pin! The pin secures with a dual rubber stopper fastener that prevents pin-spin. The pin measures 2"x1.5"
Feast your eyes on these Clear Vinyl Stickers from the Gourmet Collection! These high quality die cut clear vinyl stickers are weather-proof and perfect to brighten to your books, binders, water bottles, or any other flat surface. More T-shirts for Men, Women, and Kids! 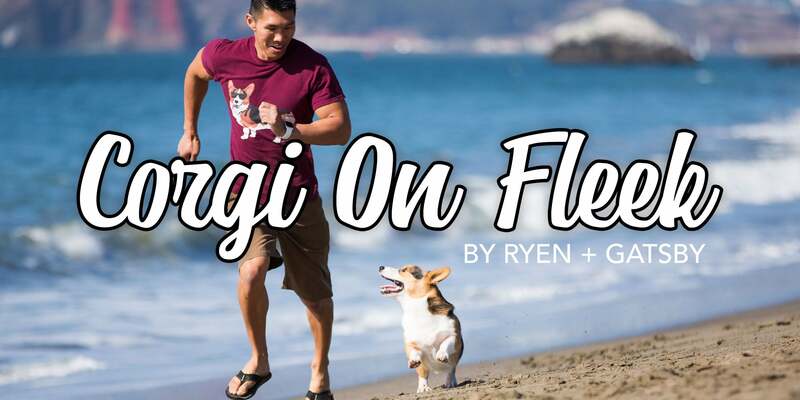 Visit the Corgi On Fleek T-Shirt Shop at Spreadshirt. Get Emailed by Ryen & Gatsby! Sign up to receive Corgi Emails including exclusive pictures, News & Sales from Ryen & Gatsby! Please check your email once you've signed up (confirmation is required). Tag me on Instagram or Twitter!